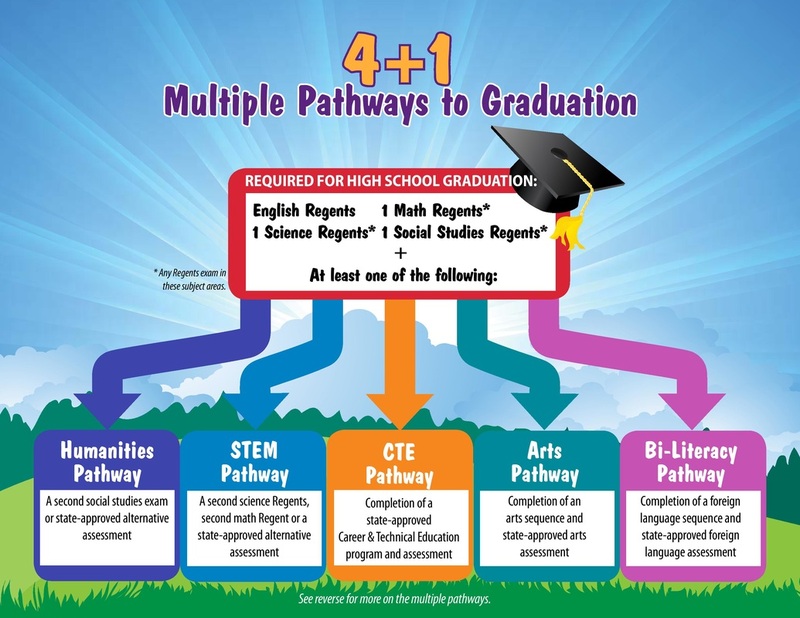 "The New York State Board of Regents approved a ground-breaking initiative on October 20, 2014, that will offer students new opportunities to develop college and career-ready skills in the arts, humanities, CTE and STEM fields. 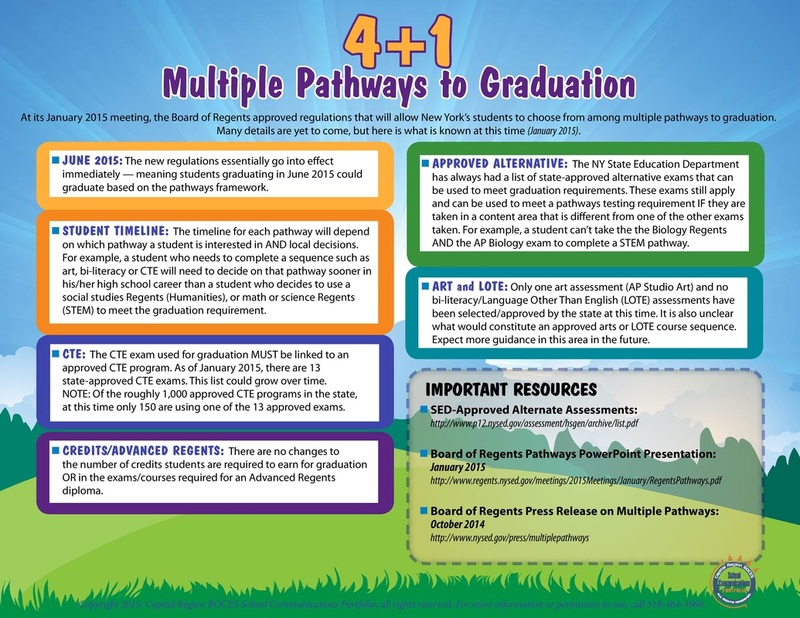 'Multiple Pathways' will provide technical skills and work-based learning opportunities, paving the way for students to take a rigorous approved exam within a pathway to fulfill part of the Regents examination graduation requirement." CompTIA A+ certification proves competence in a technician’s ability to perform essential IT tasks such as installation, configuration, diagnosing, preventative maintenance, basic networking and security. It also confirms a technician’s understanding of customer service and communication skills needed to work with clients. CompTIA was created by a consortium of IT corporations including Microsoft, HP, Cisco, Dell, and Intel to certify technicians. This test is designed for program completers and entry-level employees in the accounting/bookkeeping field, measuring knowledge and skills in such topics as general accounting knowledge, journalizing, posting, payroll preparation, cash and banking procedures, merchandise inventory, completion of accounting cycle, identification and application of source data, use of mechanical and electronic accounting devices, and data security. This test is designed for program completers and entry-level employees in the advertising and design field, measuring knowledge and skills in such topics as design theory and application, color theory and application, drawing and digital illustration, photography, typography, multimedia, digital image manipulation, production and printing, computer literacy, and communication skills. This test is designed for program completers and entry-level employees in the agricultural mechanics field, measuring knowledge and skills in such topics as general safety, welding and mechanics, power and machinery, electrical power and process, agricultural structures, agribusiness, and environmental and natural resource systems. The National Institute for Automotive Service Excellence (ASE) administers the examination to qualify automotive technicians. This examination was developed by the Assessment of Skills and Knowledge for Business Institute with technical assistance from NOCTI to measure the requisite skills and knowledge required for career success in business. This examination was developed by the Assessment of Skills and Knowledge for Business Institute with technical assistance from NOCTI to measure the requisite skills and knowledge required for career success in marketing. This test is designed for program completers and entry-level employees in the collision repair field, measuring knowledge and skills in such topics as safety, business fundamentals, MIG/GMAW and STRSW, structural, non-structural, and mechanical electrical systems. This test is designed for program completers and entry-level employees in the commercial foods field, measuring knowledge and skills in such topics as safety, sanitation, culinary career overview, culinary techniques, recipes and culinary math, purchasing and management skills, menu design and nutrition, customer and table service, and culinary equipment. This test is designed for program completers and entry-level employees in the computer aided drawing field, measuring knowledge and skills in such topics as identifying hardware and operating systems, using hardware and operating systems, interpreting and reading blueprints, creating and manipulating mechanical drawing information, drawing and designing assemblies, and using 3-D modeling. This test is designed for program completers and entry-level employees in the conservation field, measuring knowledge and skills in such topics as forestry, surveying, equipment operation, fish and wildlife, and outdoor recreation. This assessment covers all of the competencies and objectives of NCCER’s Core Curriculum: Introductory Craft Skills. Based on industry standards for criminal justice courses of study at the secondary and postsecondary levels. This test is designed for program completers and entry-level employees in the criminal justice field, measuring knowledge and skills in such topics as crime scene management, use of force, criminal law and procedures, health issues, police concepts and skills, corrections: concepts and skills, court system, communication, security: national, international, and private, and understanding and working with special populations. This test is designed for program completers and entry-level employees in the early childhood education and care field, measuring knowledge and skills in such topics as health and safety, cognitive development, language development and communication, physical development, social and emotional development, community and family relationships, observation, documentation, and assessment professionalism, classroom organization and arrangement, creativity, diversity in the classroom, inclusion of children with special needs, and positive guidance techniques and reinforcement. Based on industry standards for electrical construction wiring courses of study at the secondary and postsecondary levels. This test is designed for program completers and entry-level employees in the hotel management field, measuring knowledge and skills in such topics as understanding of the hospitality industry, guest relations and concierge duties, opening and settling financial transactions, safety and security, legal and ethical responsibilities, marketing and sales, travel and tourism, hotel restaurant management, and food and beverage service. This test is designed for program completers and entry-level employees in the medical assisting field, measuring knowledge and skills in such topics as medical office procedures, general laboratory procedures and diagnostic testing, clinical practices, patient instruction, and foundations for healthcare. The NIMS credentials are the metalworking industry’s only skills certificates that are based on national standards developed under procedures accredited by the American National Standards Institute. The NIMS credential is used by the industry to recruit, hire, place and promote. Firms use the credentials to identify skilled candidates at all levels of employment. CompTIA Network+ certification proves competence in a technician’s ability to perform essential IT tasks that cover network technologies, installation and configuration, media and topologies, management, and security. This test is designed for program completers and entry-level employees in the precision machining field, measuring knowledge and skills in such topics as organization and shop practices, measurement/inspection, metallurgical processes and heat treating, blueprint interpretation and process planning, layout and benchwork, band saw machines, lathes, milling machines, surface grinder, and computer numerical control programming, preparation, operations. This test is designed for program completers and entry-level employees in the pre-engineering field, measuring knowledge and skills in such topics as an overview of engineering, design process/problem solving, manufacturing, assembly and fabrication, materials, communication and teamwork, safety, and engineering systems. Based on industry standards for graphic communications courses of study at the secondary and postsecondary levels. This sequence addresses the core technical competencies of higher skilled production workers in all sectors of manufacturing. The ProStart® curriculum has been developed with national and local support from industry members, educators, the National Restaurant Association Educational Foundation (NRAEF) and state restaurant association partners to help students start careers in the hospitality industry. This test is designed for program completers and entry-level employees in the small engine technology field, measuring knowledge and skills in such topics as safety, general shop practices, maintenance, lubrication systems, fuel systems, carburetor fundamentals, governor, ignition, starters and alternators, engine assembly, troubleshooting, as well as cylinder head, valve service, and maintenance. 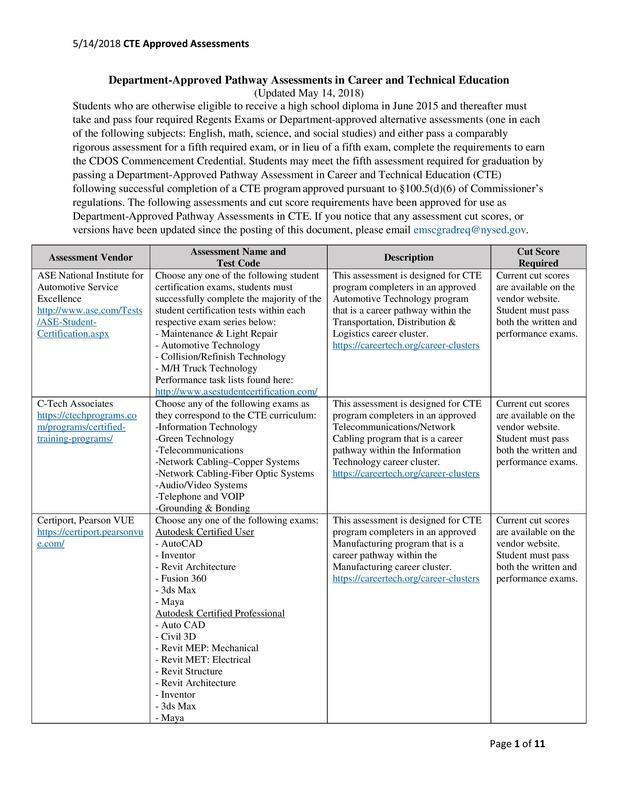 The SET Certification was developed for high school students and entry-level technicians. This test is designed for program completers and entry-level employees in the television production field, measuring knowledge and skills in such topics as safety, pre-production, production, post-production, ethics, communications, and general field knowledge. This test is designed for program completers and entry-level employees in the welding field, measuring knowledge and skills in such topics as safety, welding symbols and blueprint reading, oxyfuel cutting, arc cutting process (carbon arc and plasma arc), physical characteristics and mechanical properties of metals, weld fit-up and quality shielded metal arc welding, gas metal arc welding, and flux cored arc welding, and gas tungsten arc welding. of video screen to enlarge to full page viewing.